What is Mediterranean Landscape Design? Some people love the idea of Mediterranean design without really knowing its true characteristics. But you just know it when you see it—you can almost feel it. Everything pulls together and seems authentic, pleasing to the eye, and captures a certain essence that might remind you of a favorite vacation in Italy or simply elevate your mood. Water is an essential element in this type of garden design, so it's only natural that swimming pools are often incorporated into Mediterranean landscapes. Old World pools are usually simple in shape and design—often rectangular—and you won't see waterpark features with tricked-out slides or massive faux boulders. You'll find many of these features and more as you tour these Mediterranean gardens with stunning swimming pools, both big and small. You don't have to live on the Mediterranean Sea or even in one of its climate zones (like California) to have a home and yard designed in this popular style. If you are working with a landscape architect or designer, they should be knowledgeable in features of each design style. 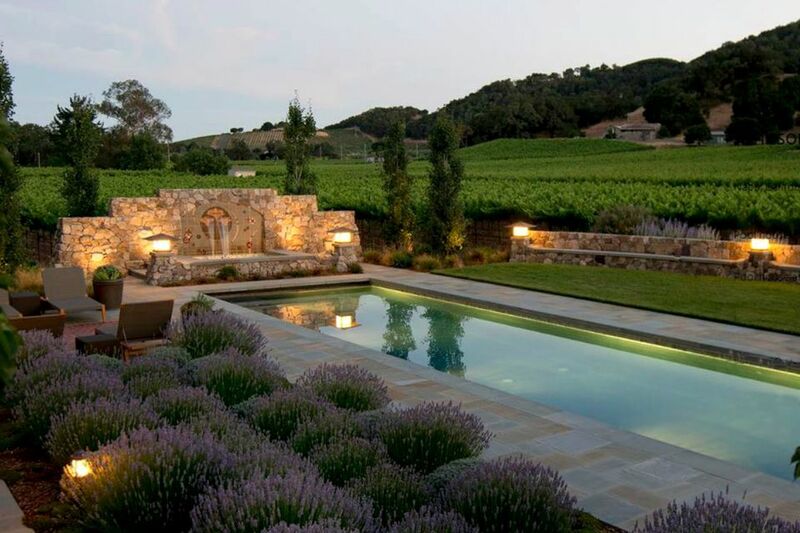 In this Northern California wine country backyard by Outer Spaces Landscape Design, the pool paving is travertine, the deck is cedar, and a simple color palette of greens, whites, and purples was used. Other Mediterranean features include a stacked-stone wall and path, a shaded area near the pool, lush native trees, and shrubs. Not all properties in Southern California are small: this one is on an acre, which is huge for this region. Designed in the Italianate style, the garden composition is formal and punctuated by a series of playful elements, including fountains, urns, sculpture, and an armillary (sphere). "Subtle variations in the elevations were created to add visual interest to an otherwise flat site," explains Nord Eriksson, principal, ASLA, at EPTDESIGN. Mediterranean features include Italian cypress trees, arches, the vine-covered pergola, outdoor dining area, terra cotta-colored walls, and the red tile roof. Many of the homes that John Hathaway, principal architect, designs for ​Vanguard Studio in Texas' Hill Country have Mediterranean influences. This home's rooms open to a center courtyard, which features a pool and spa as the perfect way to cool off from that Texas heat. Additional Mediterranean details include iron accents, use of stone, and an earth tone palette. A San Antonio, Texas, pool and spa combo have a clean, simple design—a common trait of the Mediterranean style—surrounded by natural edges formed by the flagstones that carry out from the patio right to the pool coping. The design, by Brad Sharpe Pools and Shows & Allen Landscape Architects, also features flagstone, terra cotta, and a vine-covered pergola. Platinum Series by Mark Molthan created an outdoor space in Dallas that makes a smooth transition from the interior, echoing the style and materials. The space is small but not overcrowded and the covered patio has all the modern conveniences yet doesn't appear high-tech. The pool is freeform with edges of varying levels of stacked stone. If you desire a Mediterranean garden, it helps if you happen to have the same style of house. Neolithic Designs' rectangular pool becomes a focal point (it kind of has no choice) in the courtyard of a custom-built house in Newport Beach, California. Wood-rimmed doors open for breezes and easy passage from room to room or as a quick exit to take a quick swim or lounge on the relaxing patio. A vineyard property near Yountville, California the house was designed in the Craftsman style with Mediterranean landscaping by Roche+Roche, with Kennedy & Kennedy Architects and Le Reve interior design. In addition to creating a changing room, the pool cabana provides extra outdoor storage and a small kitchen that can be open to outdoor dining and living spaces under a shade arbor. The pool decking is bluestone with brick-inset "carpets". Other custom Mediterranean touches include stone veneered set walls, screen walls with a fire pit, and a custom-tiled spa backdrop. Yes, Villa Pisano, near Austin, is an estate on a large property that most of us can only dream of owning. But Braswell Architecture's design and details capture Mediterranean features and the essence—it's a welcoming villa at which we'd all like to spend some time, lying leisurely near the pool, taking an occasional dip, enjoying meals outdoors at the long table. Clean white surfaces, blue skies, and palm trees offer a hint that this house and pool designed by Ana T. Bejar of Etno Design Marbella is in Madrid, Spain. Furnishings and few accessories give it a mod-Mediterranean look. Based in Chantilly, Virginia, Lewis-Aquatech designs and builds outdoor living spaces in the mid-Atlantic and worldwide. Projects range from estates to smaller properties. This freeform pool area has Mediterranean influences, including the use of flagstone, earth tones with accents of bright colors, covered seating and dining area. This more traditional Mediterranean pool and patio area designed by Virginia-based Lewis-Aquatech emphasizes symmetry and features wide jars on pedestals, earth tones, flagstone, stacked stone, fountains, a covered seating/dining area, small well-pruned trees, and shrubs in pots. A rectangular pool overlooking the actual Mediterranean Sea in the small coastal village of Elounda, on the Grecian island of Crete. It's not fancy or elaborate, just authentic. Note the ladder/steps to access the shore and sea. This beautiful Spanish bungalow in Los Angeles' Atwater Village district is on a fairly small lot, but landscape architect Lisa Gimmy and Koffka/Phakos Design smartly used all available space without making it obvious. The pool may be petite, but a high wall with hand-painted tiles and simple fountain add interest and make the area appear larger. Vertical space is emphasized with small trees and shrubs. Note the extra seating: inside the pool. Mediterranean touches include painted tile, fountains, and olive trees. In Orange County, properties are small by the rest of the country's standards. So, homeowners seek out landscape architects and designers who not only integrate the architecture with the landscape, but know how to maximize a yard without making it obvious. For this Mediterranean-style property in Newport Beach, Neolithic Designs added a low stone wall to create privacy, draw the eye upward, and act as a barrier since the lot backs up to a hill. Other Mediterranean details include fountains, stone, terra cotta, pavers with a ground cover, roses, and a low bench. Especially at twilight, this Mediterranean yard in Orange County, California, is calm, warm and inviting, even restorative. AMS Landscape Design Studios' design is symmetrical and neatly arranged but not overly formal and includes tumbled pavers, terracotta, pottery bowls, and succulents. Working with a narrow lot and vertical space (walls and the sky) in Newport Beach, Neolithic Designs' challenge was to add greenery to limited space. The solution: spreading vines, which soften the walls, provide color and interest, along with a narrow strip of grass. AMS Landscape Design Studios went for a simple and clean Mediterranean look for this Orange County home, with a low, wide planter as a focal point near the pool, along with clipped hedges, Italian cypress, and a fountain. Another design by Lewis-Aquatech features symmetrically arranged fountains and statuary, along with a classic pool shape, brick, planters, and pruned arborvitae. A sweeping view with Italian cypress and olive trees transport the owners of this California home to a European countryside. The same pool gets a closer look to reveal the materials used for coping, the pool deck (surround), and the block retaining wall on the slope. Other Mediterranean touches include Italian cypress trees, agaves, large expanses of bare dirt, and stone. Inspired by early 20th-century Modernist architect Irving Gill, this landscape designed by Bill Bocken Architecture and Interior Design near San Diego also includes Mediterranean features like climbing vines and palm trees. Many years spent in Europe as a child influenced native Houstonian Jennifer Hamelet, who designs and builds estates in and around Houston that are greatly influenced by, or styles like French Country, or Spanish Colonial Revival. Hamelet, who designed this French Provençal farmhouse in​ River Oak Mirador Builders, uses ​native plants that look good in a Mediterranean-style garden but will survive the Texas climate. This pool and yard have a formal layout in a limited space (not acres). Mediterranean details include fountains, flagstone, fountains, columnar trees, pavers with ground cover, stacked stone, and trained and trimmed vines.